Often in animation, a female voice actress will voice a young child character, possibly because it's not always easy to work with kids. Other times, there just happens to be a good kid VA available for the job. However when the child actor starts getting a bit older then this results in the character they voice getting replaced by a different child actor. This mostly happens with male child actors that voice young male children. This is more common in films, as voice recording for a film generally takes much less time than for a TV series. Contrast Dawson Casting, where older actors play younger characters. Ichigo Hoshimiya, heroine of Aikatsu!, started the series at 13 years old and is voiced by Sumire Morohoshi, who was also 13 years old when the series premiered. The Japanese voice acting in Barakamon have the children characters voiced by actual children. In the original Japanese version of Barefoot Gen Gen, his little brother Shinji, and Ryuta were voiced by actual young boys, whereas in the English dub they were all voiced by women. The English dub cast of Beyblade is voiced by kids who are more or less close to the characters' ages. Capeta: For the first arc (first 14 episodes), the title character was voiced by Naoto Adachi, who was 12 years old at the time. Nelvana's Cardcaptors dub of the show did this trope quite well with some characters. The 10-years old main character Sakura was voiced by then 11-years old Carly McKillip, while 10-years old Syaoran was voiced by first Rhys Huber and then Jordan Kilik, who were either in their preteens or early teens at the time of recording. When the second movie was brought over by Geneon this was not the case, with Syaoran voiced by voice actress Mona Marshall. The Latin-American Spanish dub had the then-teenaged Uraz Huerta playing Syaoran in both the TV series and the second movie. For the record, Huerta's voice sounded *quite* deeper in the movie. In Code Geass V.V. is voiced by Kazato Tomizawa, who was 10 years old when V.V. first appeared near the end of the first season. The character is not really a child, though, but an adult man whose physical growth was stunted when he got his Geass as a child. For Cowboy Bebop, Sunrise repeated the approach taken in Escaflowne, casting 15 year old Aoi Tada as Ed (and having her sing for the soundtrack). The lead in Fireworks is voiced by a young teenage boy in the English dub, rather than an adult man like in the Japanese version. Nine to 14- then back to 9 up to 13-year-old Alphonse Elric from the English dub of Fullmetal Alchemist was voiced by 12-year-old Aaron Dismuke throughout the whole series. By Fullmetal Alchemist Brotherhood, puberty hit him pretty hard so Alphonse was recast as Maxey Whitehead (Dismuke made a reappearance as Alphonse's father in his teen years). The Jewelpet movie Sweets Dance Princess has the 7-year-old Princess Mana voiced by Mina Ashida, who was also 7 at the time. The German version has an actual female child voicing the titular protagonist which is still in use Studio 100 CGI animated series and later 2014 movie. Willy is voiced by a child in the Dutch dub. Some of the child characters are voiced by actual children in the English dub of Mega Man: Upon a Star. The English dub cast of Nadia: The Secret of Blue Water is notable for casting three actual kids in the lead roles, although one child actor has to do a sometimes-convincing, sometimes-overdone French accent. The English dub of Strawberry Marshmallow cast young girls around the characters' age. The results are adorable. Vick from Vicky the Viking is voiced by a boy in the German dub. In the first English dub, 15-year-old Dilandau Albatou was voiced by 13/14-year-old Andrew Francis. Most of the children in Sweetness & Lightning are voiced by actual kids, such as Rina Endou (11 years old as of August 2016) as Tsumugi. In Wandering Son the middle schooler Nitori was voiced by a fourteen-year old boy. The issue is his voice had already begun to deepen, however it's a plot point that Nitori's voice is prepubescent until the very end of the anime. Ao in Eureka Seven AO was a middle schooler voiced by a fourteen-year-old boy in the Japanese version. Digimon Adventure: the Latin American dub cast child actors for Tai and Gomamon (Miguel Angel Leal, who was later replaced by Gerry Meza), Matt and Agumon (Uraz Huerta), and T.K. and Biyomon (Lupita Leal). In the Filipino dub of the Yo-Kai Watch anime, Nate and Katie were voiced by child actors Miggs Cuaderno and Jillian Ward, who were aged 11 and 10 respectively at the time the dub premiered. 10-year-old Judith Barsi as the orphan Anne-Marie in All Dogs Go to Heaven. In An American Tail, Fievel was always voiced by a little boy: Phillip Glasser in the first two movies and Thomas Dekker in the Direct-to-Video sequels when Phillip Glasser got too old. In The Book of Life , the Detention Kids, alongside the kid versions of Manolo, Maria, and Joaquin, are all voiced by child actors. Cats Don't Dance: The Enfante Terrible Darla Dimple's two voice actors (speaking and singing) were both in their early teens at the time of the movie's release. Scottish mouse girl Olivia Flaversham in The Great Mouse Detective was voiced by an actual Scottish 8-year-old girl, Susanne Pollatschek. Six-year-old Lilo Pelekai in Lilo & Stitch was voiced by Daveigh Chase, who was almost 12 by the time of the film's release. Chase continued to voice Lilo in the franchise's first TV series and its pilot and finale films, where Lilo ages from seven to almost ten years of age in-universe, and Chase's voice does deepen a bit late into the second season. Lilo & Stitch 2: Stitch Has a Glitch, set between the original film and Stitch! The Movie, has seven-year-old Lilo voiced by Dakota Fanning instead. Fanning was eleven years old at the time of that film's release. All the other kids in Western continuity were also voiced by kids during its run. Mertle Edmonds, in particular, was voiced by Miranda Paige Walls (born April 2, 1992) for the first film and one of the video games, and then by Liliana Mumy (two years and a fortnight younger than Walls) in the rest of the franchise. The East Asian Spin-Off shows, however, avert this entirely, as all the kids in the English versions of those shows are clearly voiced by adult voice actors with experience in anime dubbing. The preteen versions of Anna and Elsa from Frozen are voiced by children, even when singing. Moana is the first Disney "princess" film to feature a teenage princess voiced by an actress younger than the actual character, with 15 year-old (at the time) Auli'i Cravalho voicing 16 year-old Moana. Grave of the Fireflies has Setsuko, who is a five year old girl, voiced by Ayano Shiraishi... who was five back then. Her lines had to be recorded before her scenes were animated, and because the animators were not used to having to do this, they tried to avoid angles from where her mouth could be seen. While Robin in The LEGO Batman Movie is voiced by a grown man, the Mexican Spanish dub actually cast a real teenager, Emilio Treviño, who was 17 at the time of the film's release. John Morris voiced Andy throughout the 15-year span of the first 3 Toy Story movies, effectively growing up with him. Sid was also voiced by 12-year-old Erik von Detten, and Bonnie from Toy Story 3 was voiced by 9-year-old Emily Hahn. Dot in A Bug's Life, voiced by 9-year-old Hayden Panettiere. 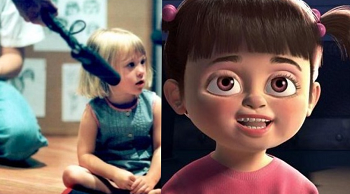 In Monsters, Inc., toddler Boo was voiced by Mary Gibbs, the little daughter of Pixar employee Rob Gibbs. The crew had to follow Mary around with a microphone and assembled Boo's lines from the things she said while she played, as Mary was unable to sit still during recording. Nemo in Finding Nemo, voiced by 9-year-old Alexander Gould. He was replaced by the 11-year-old Hayden Rolence for the 2016 sequel, as Gould would've been too old to reprise his role (they did give him a brief cameo role to make up for it). Dash in The Incredibles was voiced by 11-year-old Spencer Fox. Similarly to Nemo, the sequel has Fox replaced by the similarly-aged Huck Milner, since Fox was too old to reprise the role. Russell (9-year-old Jordan Nagai) and Ellie as a child in Up. The Good Dinosaur: Arlo, the 11-year-old dinosaur, was voiced by the 2001-born Raymond Ochoa. His voice deepened not long after he finished recording his lines. The human child Spot was voiced by the even younger Jack Bright. The child versions of the characters in A Silent Voice are voiced by actual children in the English dub. Chihiro was voiced by an actual young girl in the English dub, then-11-years-old Daveigh Chase. Yubaba's baby was originally voiced by an actual little boy (Ryunosuke Kamiki, who was also in the Japanese dub of March of the Penguins) but was voiced in the English dub by Tara Strong. Both Chihiro and Haku are voiced by children of their respective genders (Rumi Hiiragi and Miyu Irino, respectively) in the original Japanese version. Emily Prime in World of Tomorrow was voiced by an actual four-year-old, who was recorded having actual unscripted reactions to toys and pictures . Agnes in Despicable Me 1 and 2 was voiced by Elsie Fisher, who was 6 when the first film came out and 9 when the sequel came out. In the third film, Fisher was replaced by the 7-year-old Nev Scharrel. This also applies to the Japanese dub, where child actress Mana Ashida, who was five at the time, provided Agnes' voice. In the Disney dub of My Neighbor Totoro, Dakota Fanning, who was 10 at the time and Elle Fanning, who was six, voiced Satsuki and Mei. In Bravely Default, Victoria F. Stein is a mage with the appearance of a child. Fittingly, she's voiced in Japanese by Kanon Tani, who was an actual child at the time of recording. On the other hand, the English dub avoids this by having her English voice provided by Carrie Savage. In The Cluefinders games, actual children voice all the characters. Which makes it a little jarring in The Incredible Toy Store Adventure when they're suddenly voiced by completely different people, as the previous voice actors no longer sounded like children who were ten and eleven. In Dissidia: Final Fantasy, The Onion Knight, a Kid Hero who's explicitly the youngest of the heroes (which puts him at fifteen or younger) was voiced by the 19 years old at the time Aaron Spann. He also had previously voiced Joshua in The World Ends with You, who's fifteen at least in appearance. Kingdom Hearts: In the first game and its sequel, fourteen-year-old Sora was voiced by then-14-year-old actor Haley Joel Osment. When the sequel was released five years later, Haley's voice had obviously changed. However, Sora also had aged enough between games to justify the lower pitch. All in all, a rare VA example of both actor and character experiencing a puberty voice change. However, Re: Chain of Memories, which takes place right where the first game ends, Haley's still playing Sora. He, of course, sounds too deep. In the original Lunar game for the Sega CD, Lunar: The Silver Star, 15-year-old protagonist Alex is actually voiced by a then preteen Ashley Parker Angel. For the first remake, Silver Star Story, Working Designs, the series publisher, considered replacing Angel because he hit puberty, but ended up calling him back in anyway, feeling that this "new" Alex was a bit more "grown-up" than the original. The first Mega Man Legends game had Mega Man Volnutt voiced by the 14-year old Corey Sevier, but in the second game the voice was given to Susan Roman, who voiced Mayor Amelia in the first game. In the Disney PC game Nightmare Ned, 10-year-old Ned Needlemeyer was voiced by then 10-year-old Courtland Mead, known for other Disney roles such as Gus Griswold from the show Recess. In Ni no Kuni, the 13-year old Kid Hero Oliver is voiced by the 10-year old Adam Wilson. Laura in Silent Hill 2 was voiced by the at-the-time eight years old Jacquelyn Breckenridge. She wasn't told about the dark nature of the game she was voicing for, of course. Sonic the Hedgehog games originally played this trope straight with eight year old Tails, who was voiced by the then-teen Corey Bringas in Adventure 1 and 2 and William Corkery in Heroes, Battle and Advance 3 after Bringas hit puberty. He's then been voiced by women from 2005 on. In many Living Books CD-ROM games, kid characters were voiced by actual children. The Adventures of Willy Beamish: Willy Beamish was voice by Michael Zibelman, and it's his only acting credit. 10-year old Atreus from God of War (PS4) is voiced by the 13 year old Sunny Suljic. Theta from Red vs. Blue, while an A.I., has the personality of a child. He is voiced by J.D. Burns, the young son of series creator Burnie Burns. In 3-2-1 Penguins!, both Jason and Michelle Conrad had two child voice actors. Jason's first voice actor, Mark Marten, was around 7-9 years old. His second voice actor, Quinn Lord, was 7 years old. Michelle's first voice actress, Melissa Peterson, was around 7-9 years old. Her second voice actress, Claire Corlett, was around 7 years old. Twelve-year-old Finn is voiced by Jeremy Shada, who was 13 when the voice recording first began. Time passes over the show's history, so Finn's voice deepened with his voice actor's... until a certain point, since Finn definitely does not sound anything like Lance at this point. Goliad and is voiced by an actual young child. Gumball and Darwin are 12 and 10, respectively, and were initially cast by actors about the same age. After three years of production, during which both had their voices noticeably deepen, they were recast by actors who were four years younger at the beginning of the third season. About three years later, both characters had their voices changed again partway into the fifth season. Finally, Darwin's voice actor changed again early in the sixth season, less than a year later. There's always an in-universe event that suddenly causes the characters to suddenly sound younger, much to their confusion. Anais was also cast with a child voice actor, albeit one who started five years older than the character, because finding an actual 4-year-old who can talk like a Child Prodigy would be extremely difficult. Since her voice hasn't changed as much, the same voice actress has played Anais well into her teens. Skippy Squirrel on Animaniacs was voiced by Nathan Ruegger, the then-preteen son of show writer Tom Ruegger. Numerous boys on Arthur have been voiced by actual boys, including the title character. Oddly enough, D.W. has always been voiced by pre-pubescent young boys as well. Arthur, D.W., The Brain, George, the Tibble Twins and several other younger boy characters have been recast numerous times throughout the show's 21-year run. Aang is voiced by Zachery Tyler Eisen (b.1993). Another main character, Toph Bei Fong, is voiced by Jessie Flower, who turned twelve the very same year her character was introduced. Any other kids their age or younger are voiced by children of the same gender and approximate age, and most teenagers are played by same gender voice actor that are usually at least a bit older (for instance Sokka is 15 and his VA was 18 when they started). The exceptions are Suki and Zuko, whose voice actors Jennie Kwan and Dante Basco were in their 30s. An interview reveals that the series creators "really wanted" a real kid to play Aang, rather than Cross-Dressing Voices, and that as Eisen's voice has been deepening, the show's sound people have been artificially pitching it up, without the creators even noticing. On Beetlejuice, then 14-year old Alyson Court voiced Lydia, although Court had voiced other child characters during this time such as Veronica Lodge on The New Archies. Fellow Canadian voice artist Tara Charendoff (today Tara Strong) was 15 when she voiced Beetlejuice characters Claire Brewster and Prudence, but she can still knock a child character voice out of the park today. In The Boondocks, Jazmine DuBois was voiced by Gabriela Soleil, who was about 10 years old (same age as her character) when the show began. In the German dub of the Bugs Bunny cartoon "Portrait Of The Artist As A Young Bunny" actual children voiced the child versions of Bugs Bunny and Elmer Fudd, who in the original version were voiced by the then 72 year old Mel Blanc. Charlie, Lola and all the characters on Charlie and Lola are voiced by actual children. Although the children refer to adults, even asking them questions, no adult voices are ever heard. Classical Baby uses appropriately aged children to voice any child characters. Chowder: The title character, Panini, Gorgonzola and Ceviche are all voiced by children. By the final season Chowder's voice was several times deeper than it originally had been due to his voice actor hitting puberty. CH Greenblatt's other cartoon, Harvey Beaks, reuses this with its main trio of Harvey, Fee, and Foo, as well as all the supporting kids except Dade (who is voiced by C.H. Greenblatt himself) and Princess (voiced by Andres Salaff, one of the show's writers). On Clue Club (a Scooby-Doo expy from 1976 from Hanna-Barbera), 13-year old Dotty was voiced by then 11-year old Tara Talboy. A teenage voice actor was ideally wanted to voice Danny; however, none of them were considered "heroic enough". Danny's female clone, Danielle, was played by the then 13-year-old AnnaSophia Robb. Across the DC Animated Universe, The Batman, and Batman: The Brave and the Bold, any Robin younger than college age was voiced by a boy. Save a small bit, Tim Drake's laugh-to-crying as Joker Junior in Batman Beyond: Return of the Joker, which was provided by the show's voice director. In Dragon Tales, Max, Emmy, and Cassie were all children or teenagers when they were voicing their characters. Mac from Foster's Home for Imaginary Friends is voiced by Sean Marquette, who, surprisingly, was not replaced after he had gone through puberty, but instead had his voice digitally pitched up. Though it is still obvious if one compares episodes from Season 1 to episodes afterward. Marquette had also previously been on the Nicktoon Rocket Power. This example is particularly interesting when one realizes that Mac's 13-year-old brother, Terrance, is voiced by a woman (Tara Strong) even though the character has a fairly deep voice. Arnold himself had fournote seven counting the theatrical pilot, The Jungle Movie and his Time-Shifted Actor in flashbacks. The first actor to play Arnold (Toran Caudell) was given a new recurring role after his voice dropped, as the fifth-grade bully Wolfgang. The second Arnold (Phillip Van Dyke) made two guest appearances as One Shot Characters Sandy and Ludwig. Gerald's voice actor (Jamil Walker Smith) is an exception. There's even an episode that explains why his voice changed, "Gerald's Tonsils". Though Smith was finally replaced when Hey Arnold! The Jungle Movie was made, since he was in his thirties at that point and far too old to do a child's voice. In addition to Arnold, Curly and Eugene were voiced by several actors; one of the Eugenes (Ben Diskin) went on to become an adult voice actor despite having to be replaced. However, a few of the actors for the boys were kept all the way through along with Gerald: Harold's actor's voice broke after the pilot, but the creators felt his deeper voice suited the character better and he was kept on; Stinky, whose voice did break, though it was simply ignored and not justified like Gerald's was; and Sid, who managed to evade puberty for the entire five-season run, until the last three episodes, produced a year after the rest of the fifth season. He was replaced, appropriately enough, by his younger brother. Hey Arnold! The Jungle Movie continued that trend for the most part, with most of the original child actors replaced with other children due to the 16 year Sequel Gap between the original production run and this film. However, Francesca Marie Smith (Helga), Anndi McAfee (Phoebe), Justin Shenkarow (Harold), Olivia Hack (Rhonda), Danielle Judovits (Big Patty) and Danny Cooksey (Stoop Kid) all reprised their roles despite now being adults. Anndi McAfee is a borderline case, as she was 17 when the show premiered and was 38 when The Jungle Movie came out. Both Henry and June were voiced by real kids, with Noah Segan (Henry) being twelve and Julia McIlvaine (June) being nine when they began playing the two ten-year-olds in early 1996. By the second season, Henry's voice had broken, while June's voice gradually got lower as the show went on. Like Henry and June, Loopy and Larry from Life With Loopy were also played by real kids. And like Henry, Larry's voice broke in the second season. Danielle Judovits, who voiced Loopy, was nine when she began playing the seven-year-old protagonist in the pilot ("Goldfish Heaven") when it was produced in 1994 and fourteen by the time production on the show ended in 1999, causing Loopy to have a much lower voice in the later episodes. The Possible Twins, Jim and Tim, from Kim Possible, are both played by Shaun Fleming. He was 12 while recording season one, when the "tweebs" were 10. According to producers, Tim and Jim got a redesign and height boost in season four, either to justify Shaun's voice change or to justify a new actor. In the end, Disney went with a new actor, also a young boy: 13-year-old Spencer Fox, better known as Dash from The Incredibles. Of course, by season three, Fleming's voice had obviously broken, and no attempt was made to hide it. This had the bizarre result of the "tweebs" looking older but sounding younger than they had in the previous season. In the 1980s series of The Little Rascals, Scott Menville and Shavar Ross, then both 11 years old, were Spanky's and Buckwheat's respective voice actors. The dwarf actress Patty Maloney, then 46 years old, who had played furry male roles in the 1970s, was aptly cast as Darla Hood. Lincoln Loud of The Loud House is voiced by a boy about his age. Likewise, his Black Best Friend Clyde. His sisters are all voiced by adult women, though. The second Nelvana cartoon based on Rosemary Wells' books is Max and Ruby, which had an actual young child to provide the voice of Max at least twice during the show's run. From Mixels, Nurp (the infant half of Nurp-Naut) was voiced by very young child actor Justin Grollman, who, in supplemental work for a live-action short he was in, was revealed to only just be going into kindergarten. Shapey Puppington from Moral Orel was voiced by the creator's daughter, Tigger Stamatopoulos. The Cutie Mark Crusaders from My Little Pony: Friendship Is Magic are voiced by young girls. This created a problem as the series went on, though: Their voice actresses hit puberty but the foals didn't, thus creating some Vocal Dissonance in the characters. Sweetie Belle's voice used to squeak heavily, but by season 5 it no longer does. Season 7 finally decided to show that the CMC are aging, thus explaining their maturing voices. A lot of Nick Jr. animated titles seem to go along with ensuring that actual children portray child characters now. The Backyardigans and Go, Diego, Go! are two of the more notable examples. The weird part is, Uniqua in the former is voiced by a girl, but has a fairly deep voice for her gender and age. In the British and American dub of Make Way For Noddy. Noddy is voiced by an actual boy while in previous incarnations of the series he was mainly voiced by a female. In the American dub of the show that was made for The Noddy Shop, Tessie is voiced by an actual girl despite her age never being stated. All of the characters in the Peanuts animated specials are voiced by children, which is retained in the Hebrew dubs. The first special, A Charlie Brown Christmas, may even be the Trope Maker, seeing as how it was the first time a cartoon used actual children to voice child characters. Of course, the children doing the voices were also very young, and had to have their lines cued to them since most of them either couldn't read the scripts properly or couldn't read them at all. The stilted dialog that the characters provide later became a staple of the Peanuts specials. In fact, only Charlie Brown was ever voiced by a professional child actor. The Christmas Tree is a good example of how this can backfire. The child characters seem to be voiced by actual five and six-year old kids and given little to no voice direction. The result is a lot of mumbling, slurring, and bad acting. Bizarrely averted with one child who is clearly voiced by someone much older and sounds entirely out of place from the rest of the kids. Another one has an oddly distorted voice, possibly indicating that child was also voiced by someone older, and the voice sped up to try and hide this. All of the kids in Phantom Investigators were voiced by actual children or teenagers. In the Latin American Spanish version, Bubbles has a child voice actress. In the English version, Bubbles is voiced by a then 13 year old. The 9-year-old cast of the prime time edition of Punky Brewster voiced their cartoon counterparts in the Saturday morning edition. In A Pup Named Scooby-Doo, the gang, with the notable exception of Shaggy and Scooby (Casey Kasem and Don Messick both reprised their respective roles) are voiced by children. Fred's voice actor apparently went through puberty as his voice is slightly deeper in later episodes. All of the main kids in Recess were also voiced by like-gender children (apart from Spinelli, voiced by the adult Pamela Adlon Segal). Apart from TJ, who went through four actors during the show's course, the voices stayed the same throughout the show. Sheegwa the kitten from Sagwa, the Chinese Siamese Cat is voiced by a young girl. Similar to in the early video games, Tails was voiced by child voice actors Christopher Welch and Bradley Pierce respectively in Adventures of Sonic the Hedgehog and Sonic Sat AM. Kindergartners in South Park are voiced by young kids, even when they curse, a notable example is Ike, which accounts for his dialogue being Baby Talk in earlier episodes. Averted for the older kids, which are voiced by adults. Steven Universe: When initially cast, the voice actors for Steven (who also voices Onion), Connie, and Peedee were fourteen or fifteen (only a few years older than the characters, besides for Onion). However, all three characters have only aged about two years while the actors have since reached their twenties. TaleSpin used children to voice Kit Cloudkicker, Molly Cunningham and their friends. When the voice of Kit's original actor started to change, he was replaced by another child with a similar voice. So far most of the animated adaptations of Beatrix Potter's The Tale of Peter Rabbit story would usually have actual children voicing Peter Rabbit and his sisters Mopsy, Flopsy, and Cottontail. The most notable would have to be Mopsy, Flopsy, and Cottontail who were voiced by girls in Peter Rabbit and The World of Peter Rabbit and Friends. Past adaptations would usually have Peter's sisters voiced by grown women such as one episode of the HBO Family series "Storybook Musicals" which gives a musical take on the story while Peter was voiced by a child who also sang and the Merri Melodies short "The Country Boy" where all of the bunnies were voiced by females. Cottontail gets special mention since in the 2013 CGI series "Peter Rabbit" while Mopsy and Flopsy are voiced by girls. Cottontail is voiced by a girl who might had possibly been around age 5 or 6 since Cottontail in the series is a toddler. All four of the boys in The Magic School Bus are voiced by real boys, and all of their voices break over the course of the series. The Nelvana Animated Adaptation of Rosemary Wells' Timothy Goes to School book and Yoko & Friends series. It uses actual children to voice at least four characters (Timothy, Yoko, Charles, and Juanita). Lisa Yamanaka, who voices Yoko, is the most notable since she started hitting puberty at the time of the show's original run in 2000 and may have been a preteen. Lisa previously voiced Wanda Li on The Magic School Bus back in 1994 and later voiced Sherry in Resident Evil 2. Both of Craig Gerber's shows, Sofia the First and Elena of Avalor, all have child characters voiced by children within the same age range, whether through replacements or whenever they first started voicing the character. For example, in the former, Ariel Winter (Sofia) and Darcy Rose Byrnes (Amber) were both 14 when the show came out, meaning they were 12-13 when recording. James has gone through three voice actors due to puberty (Zach Callison, Tyler Merna, and Nicolas Cantu). The latter has Isabel voiced by Jenna Ortega, who turned 14 the year the show came out, meaning she was 12-13 when recording. The "Adventures In Vallestrella" shorts have there baby Jaquins voiced by Gia Lopez, and the sons of Craig Gerber and Sam Riegel. The two shows Chris Nee created, Doc McStuffins and Vampirina, have child actors also. The former has its title character voiced by two actresses, both of whom were 12-13 when starting out. The latter has its title character voiced by a 12 year old girl. In Ready Jet Go!, Sean, Sydney, Mindy, and Mitchell are all voiced by pre-teens. Sydney and Mitchell's VAs got replaced in the TV movie with younger voice actors, which is part of season 2. On the Llama Llama animated series, according to producer Reed Duncan ,note Anna Dewdney's longtime partner several of the child characters on the upcoming Netflix show are voiced by actual children. The youngest is six years old. The dogs and Ryder on PAW Patrol are all voiced by kids, changing from time to time. For example, Ryder, Chase, and Marshall have all had three voice actors. In Puppy Dog Pals, Bingo and Rolly are voiced by child actors. In the 2003 adaptation of The Berenstain Bears, Brother and Sister are voiced by kids. While Sister kept her voice throughout that show's run, Brother Bear went through two voice actors, one of them being Michael Cera. The titular character of Atomic Betty was voiced by an actual girl around her age, Tajja Isen.